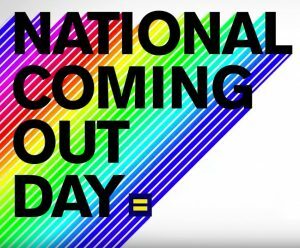 It’s National Coming Out Day on Thursday, October 11 – an annual awareness day that’s amplified each year by the Human Rights Campaign (the USA’s leading LGBTQ civil rights advocacy group) and many other organisations and individuals worldwide. This year’s #NCOD will mark 30 years since the Day was founded in Los Angeles as a day of positivity to celebrate coming out – the date marks the anniversary of the Second National March on Washington for Lesbian and Gay Rights, a rally that drew tens of thousands. So what should be the significance of the day in our sports and sports media communities? As a network, Sports Media LGBT+ firmly believes all lesbian, gay, bisexual or transgender people should be free to celebrate who they are. However, we also recognise that it’s not always safe for individuals to do so, depending on their location, personal situation or social environment. For all of us who are LGBT+, coming out is not a one-time act – something Beth Fisher knows only too well. 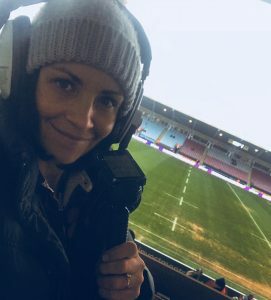 Beth is a former international hockey player who is now working for BBC Sport Wales as a Broadcast Journalist. 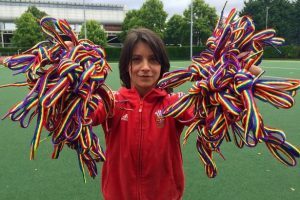 She passionately believes in the importance of athletes and sports to rise above the parapet and to be visible in their support for equality and diversity. MUM: Well, what is it then? (pause) ARE YOU GAY?! I went back home that evening expecting at least a little probing from Mum – you know, the normal questions like ‘how long have you known?’, or ‘so that’s why you watched A League of Their Own [the one with Geena Davis, not the one with James Corden] like a million times’. But there was nothing; no questioning or weird atmosphere. It was normal – and I didn’t like it. I had kept this ‘secret’ for over SIX years. Lying had become the norm. Making up pretend friends and events had become second nature. I felt guilty, and this was my chance to explain my actions. I firmly asked Mum: “Why won’t you talk about it?” Her response was simple and loving. “Because it doesn’t matter, and I love you just the same,” she said. Looking back, I realise how lucky I was to have such an amazing response. However, subsequently, I have met many men and women whose coming out experiences have been harrowing. They still haunt me to this day. For my own part, I thought mine was done and dusted – but the thing with coming out is that there isn’t an announcement on the news so that everybody, everywhere finds out. Nor is there a sign you can wear that says ‘Hi everyone, I have just come out! Cheers! x’. Doctors – we all dread THAT question. Any other public display of affection – walking down the street holding hands… let go, or keep holding? Half the time, of course, people don’t care – and it is, in fact, 16-year-old me that’s the problem, still a little scared to be my authentic self. Then there are times when I jump out of the closet feeling confident and scream “I AM GAY AND THIS IS MY GIRLFRIEND!” But sometimes I’m scared of the response and I’m so far in the closet that I could be in Narnia. Over the years, I’ve been lucky that my ‘coming outs’ have been reasonably pain free. But the worst was when I told my best friend from school. Like a dagger to my heart, it was the response I feared most – and it was part of the reason I didn’t come out in school (I went to an all girls school). Although I’ve made light of my situation, I must reiterate that for millions of people, the experience can be painful and sometimes heartbreaking. Some will never come out and will consider this a burden they live with their whole life. The media has a very important role to play with coming out stories. When conducted properly and reported with the person’s blessing, it can be a beacon of light for those struggling with their own sexuality and the fear of coming out. One example of where the media often doesn’t help is in the example of there being no openly gay or bisexual male professional footballer in the UK. It’s an ongoing situation that’s frequently referred to – particularly in gossip headlines with the word ‘GAY’ in capitals on the front pages of tabloid newspapers. We’ve even had players such as Luke Shaw and Michy Batshuayi feel like they have to defend themselves from rumours, publicly issuing ‘it’s not me’ comments. These are damaging because they suggest that being gay is a problem. Putting such a focus on the sexuality of mystery male footballers feels like a witch hunt – is it any wonder that players who are gay or bi would rather stay quiet? As a society, we must ensure that we create safe environments for LGBT+ people to be able to be their authentic selves. So as we mark National Coming Out Day this year, let’s keep this in mind. Whether it’s in a social circle – in the workplace, in school, or in a sports club – we all need to be mindful of how our actions and language might affect a person who is LGBT+ and who is battling with their own question of when and how to come out. It doesn’t matter what your own sexual orientation or gender identity is – everyone who’s connected to someone who’s LGBT+ plays a part in that individual’s coming out process. Your actions could truly change someone’s life – they could even save one. 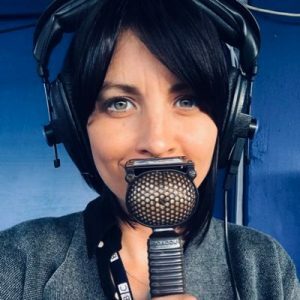 Follow Beth Fisher on Twitter at @BethFisher04. This entry was posted in Network News, Our Stories in Sport, The LGBT Line. Bookmark the permalink. ← #AuthenticMe: Join us on October 9!